New images published on Wednesday appear to support rumors that Apple will finally bring Siri to the Mac in the next major version of OS X, premiering at WWDC 2016 in June. 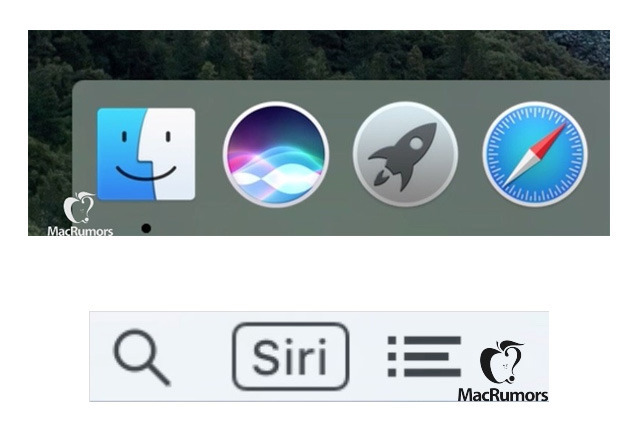 A Dock icon shows the familiar Siri waveform, while a Menu Bar icon simply uses the word "Siri," according to MacRumors, which said it obtained the images from a reliable source on Apple's software plans. One or both icons could potentially be placeholders, changing before the next OS X upgrade releases in the fall, or even Apple's WWDC keynote. The site added that Siri for the Mac will also support always-on commands via "Hey Siri." That option is allegedly turned off by default however, requiring people to go into the Preferences menu to toggle it. Siri's absence on OS X has been conspicuous. The platform launched for iOS in 2011, and in fact arrived on the Apple TV last year via tvOS. Feature-wise, it's uncertain what might make the Mac incarnation unique. Alongside iOS 10, the next big OS X upgrade should be a centerpiece of the WWDC keynote, scheduled for June 13. Apart from adding Siri support, Apple may also be planning to rename the platform back to "MacOS", in keeping with the names of its other operating systems.